Just over thirty days ago I sat the CFA® Level 3 Exam. I’ve been applying to job openings ever since. I of course do not have my score, rumours online have the exam results being released August 28th, but in the mean time with my new found free time I go to the gym, despite a bad knee injury, and try to whittle away at my ta-do list, including plans to update this blog and the my CFA flashcards. Apparently I finally mastered the CFA Curriculum or at least the exam format as I passed the Level 3 exam on my first attempt. I’ve of course been applying to new jobs since I wrote my final CFA exam, but I’ve yet to have one interview. I’ve also been updating this website and now that I never have to study for a certification exam again, knock on wood, I’ll probably finally get around to fixing and updating many things on this website. 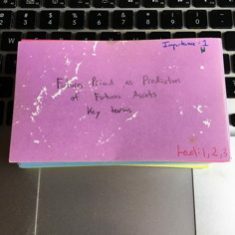 Last year I typed up a list of all the flashcards I was studying right up until exam day, this year I planned to do the same thing, but first I had a few more general thoughts. If I had to rewrite I would of course start with any newly added material, but I’ll also start with the flashcards linked to below, questions I’ve collected, and whatever material I did worst on during the actual exam along with the most dreaded material which for Level 3 may be currency hedges with options such as collars or swaptions. The CFA Institute changed their website, they may have changed it for the 2017 December Level 1 exam, but now the online practice problems and exams are handled differently. You no longer can just redo an individual item set, in fact if you want to redo any of the item sets you have to blow away all your scores. Which I was unable to do using Safari. The CFA Institute has also added gameification to their online study materials. I earned several badges, there may even be badges for passing the actual exams which I can add to my social media profiles. 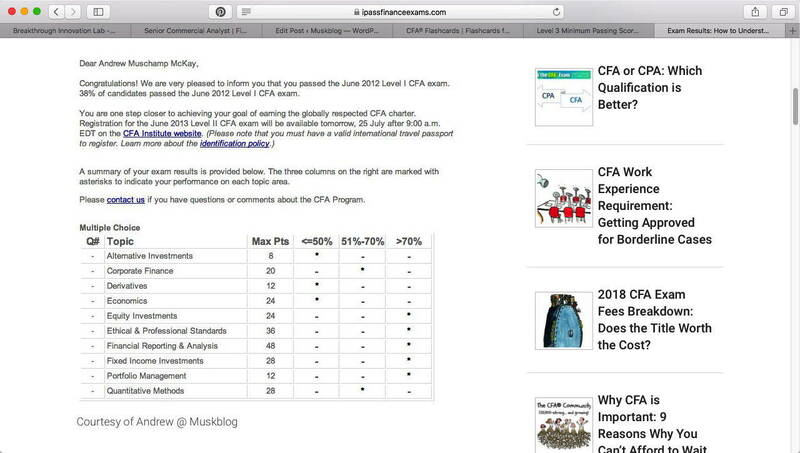 The best new feature is the CFA Institute ranks you based on your latest performance in the online practice problems. I redid all the online problems in the two weeks before the exam and my score and ranking gave me confidence that I should pass, but the morning portion is considered the most difficult part of the Level 3 exam and I will just have to wait and see, hoping my months of studying and long run average are sufficient. 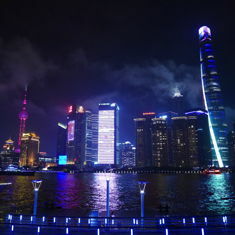 According to Mark Meldrum the CFA Institute has been paying close attention to social media, hopefully including non-English social media, and a reckoning is coming. I just want to post a few images after months of studying, hopefully this is “OK”. Hopefully they won’t immediately get stolen, I mean if you’re an expert in passing the CFA exam why don’t you have an image of your email confirming you passed the CFA Level 1 exam, why use mine? The screenshot I was worried about is below. I took it the evening before the exam, don’t steal it! My interpretation of the data was if I just maintained my average performance I would pass. I think this is good information for a candidate to have. Confidence is very important to passing CFA exams. Previously you could calculate you scores in practice problems and exams, and I of course did, but you had little data comparing yourself to other candidates. I also took a screenshot of the WordPress analytics for the my collection of flashcards. Traffic increases every week starting in April then after the exam traffic falls completely off a cliff. Level 1 candidates do the most panicked searching so traffic will pick up again as the December exam approaches but every year traffic peaks the week before the June CFA exams. Just in case I get in trouble for my screenshot, I also made an Excel file of my practice exam performance and kept track of my performance on a sticky which I then photographed with my iPhone, but honestly if 54% of candidates pass and I am supposedly in the top 45% I should have a solid chance to pass right? My strength after eight months of studying was Equity Investments so I re-did those problems last and ended up doing considerably worse, but I probably shouldn’t have still been doing practice problems at that point in time. Hopefully I got a decent night’s sleep and did well enough on the actual exam. I focussed on speed in the morning, I know I did not get them all correct but I at least wrote something in all the boxes. In the afternoon I had time to double-check about two thirds of the problems, I’ve since lurked in some forums online and the consensus was the exam was hard and people are hoping the Minimum Passing Score is in the low 60s. I still don’t recommend blogging about being a CFA Candidate, apparently people who are supposedly experts in passing CFA exams will liberate your images. Maybe I gave permission but in 2018 after all the crap I’ve been through I’m rescinding my permission if I did in fact give it. Maintaining a blog as long as I have is far from easy, don’t let the social media experts who have been doing it for 2-3 years tell you otherwise. Standard III(E) – Preservation of Confidentiality covers which clients? What are the key factors that a trustee should consider when investing and managing trust assets? 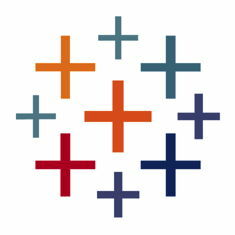 What are the 6 parts of the CFA Code of Ethics? What are the properties of a normal distribution? During asset bubbles investors often exhibit symptoms of which bias? The maximum profit from a collar position is? The 4 Equity Monetization Options are? Under GIPS what is considered a real estate investment? A needs-trustworthy-agent focus is appropriate when? Disadvantages of volume-weighted average price (VWAP)? Which of indexing, enhanced indexing, and active investment management tends to have the higher information ratio? This post was a lot of work, I’m not sure it was worth it, especially considering I keep discovering my content on other websites… I really do not want to spend another year studying for the CFA exam and I’m long overdue for a new job so you might as well look at my resume if you’ve read down this far. Google is your friend. I collected several lists of other CFA Candidates who blogged. Some completed the program, some abandoned their blogs because it is so much extra work and honestly I have not seen a positive ROI. In 2019, I have been revising and improving my blog, trying to make it more timeless and future proof. I’ve also taken a fresh look at the web analytics so I have an even better idea of which flashcards are popular every year and which being frantically reviewed just before the exam. I suspect I must now update that post annually, but the list above is what I studied when I passed the CFA Level 3 exam. If you have thoughts on the CFA Program you can leave them below but this is not one of my most popular CFA blog posts. Hopefully, it is of use to someone because I spent far too much time and effort on the CFA Program and this blog. This entry was originaly posted on July 25th, 2018 , it was last edited on April 23rd, 2019 and is filed under: Finance and tagged: Blogging, CFA®, Exam, Flashcards, Level 3.